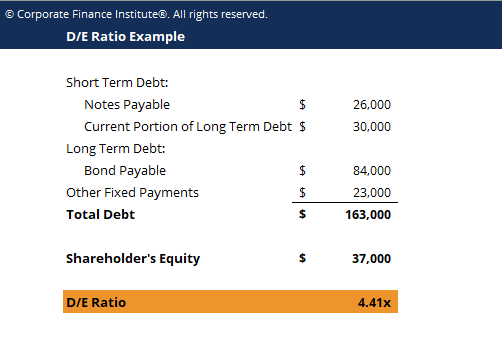 This debt equity ratio template shows you how to calculate D/E ratio given the amounts of short-term and long-term debt and shareholder’s equity. The Debt to Equity ratio (also called the “debt-equity ratio”, “risk ratio” or “gearing”), is a leverage ratio that calculates the weight of total debt and financial liabilities against the total shareholder’s equityStockholders EquityStockholders Equity (also known as Shareholders Equity) is an account on a company's balance sheet that consists of share capital plus retained earnings. It also represents the residual value of assets minus liabilities. By rearranging the original accounting equation, we get Stockholders Equity = Assets – Liabilities. Unlike the debt-assets ratio which uses total assets as a denominator, the debt to equity ratio uses total equity. This ratio highlights how a company’s capital structure is tilted either toward debt or equity financing. A high debt-equity ratio can be good when a firm can easily service its debt obligations (through cash flow) and is using the leverage to increase equity returns.